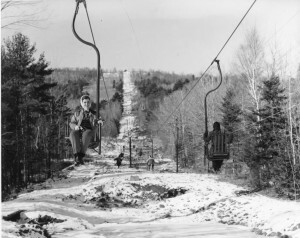 The first chairlift in New England was built in Gilford, New Hampshire, at what is now called the Gunstock ski area. It was built in 1937 and began operation in January, 1938, making it the fourth chairlift in the United States. As part of the recovery plan from the previous Great Depression, Belknap County tapped into New Deal funding to build the Belknap Mountain Recreation Area now called Gunstock. The 3200′ chairlift was actually on Mt. Rowe which is located right next to the current Gunstock area. Its commanding view of Lake Winnipesaukee made it a popular summer attraction as well as a winter ski lift. Visit http://www.weirsbeach.com/newmedia/12views/view11.html to see many historical pictures of the chairlift and related area. Stowe does get the honor of being the second chairlift in New England and this December marks the 70th anniversary of the old Mt Mansfield single chair. I believe the actual anniversary was on December 9th. I have been reading your print articles since your beginning but must confess this is my first visit to this excellent site. Thank you much for your efforts! Solely due to the fact I lived about one mile from it, I was aware of the history behind the Belknap single and rode it many times during the ’50s. I am a shareholder at Mad River Glen and today the experience there is similar but better. Interestingly the lift had the modern single pole type towers rather than the lattice type of Stowe’s and those which Mad River Shareholders voted to painstakingly retain during the single’s VT Tramway Board mandated rebuild for their retro look. As a result the lift was much closer to the ground and often had to be dug out along the line as seen in photos of similar efforts at the original Sun Valley chair. The chairs themselves were, as I remember very similar to those of Stowe and Mad River. 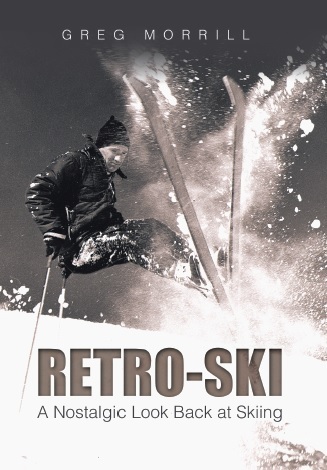 The Works Progress Administration had constructed 10, 20 and 60 meter (with a 40 meter added later) ski jumps and Gilford was a Mecca for Nordic events similar to Rumford, ME, Berlin, NH, Brattleboro, VT, Salisbury, CT and Lake Placid, NY. As a final note and as a result of the cable of the Mt. Rowe single parting during the summer of 1954 with tourists riding, the first state tramway safety regulatory board was established in New Hampshire. Because the towers were so low fortunately there was only one fatality. Unlike today’s modern grips, the old chairs were attached with vulcanized, tapered rubber buffers on both sides and severe corrosion had occurred beneath them. The Safety Board required the covering be removed every summer, the cable inspected and the chair moved several feet down the cable. On some fixed grip lifts I have ridden lately I have noticed the progressively faded white paint marks applied to the cable during this procedure. Also after this incident the safety bar and footrest had to be used year round (prior, Belknap had removed them during the winter) and ever since then I have always felt a bit uncomfortable riding without them as is still done on some of the older chairs in the West. Thanks for your great input! Indirectly that failure of the Belknap chairlift generated an assignment in my Intro to Engineering course at UNH some 10 years later! I enjoyed your article. Do you have any idea at all where I could get my hands on an original Mt. Mansfield single Chair? Its really important!